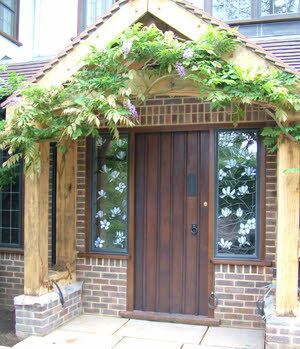 My customer came to me to discuss the design and manufacture of 2 windows for her new front door. 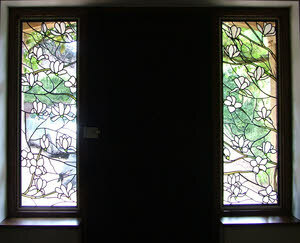 She had just come back from a holiday in the States and had seen the original Magnolia panels by Tiffany. We wanted to create something similar using that as our inspiration. I trawled through my books and the internet and discovered that he used a particular glass called Drapery, made by Uroborous. Then I found a fabulous YouTube video of them making it! They were so helpful and sent me a sample. However as soon as I unpacked the parcel I realised that this glass was not suitable for a 21st Century panel , encapsulated into a sealed unit and also the manufacture would have taken so long that my customer may have had kittens when she realised how long the panels were going to take to make! Look at the video to give you an idea of how rippled this is. I then found they made another glass called Herringbone which was much more suitable. We wanted to keep the palette very limited and so we chose a lovely streaky glass for the branches and a mouth blown antique glass with reams for the background. 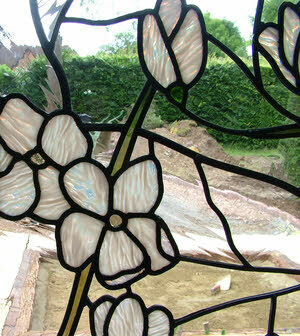 One comment has been that it looks as if a breeze is blowing through the magnolia! 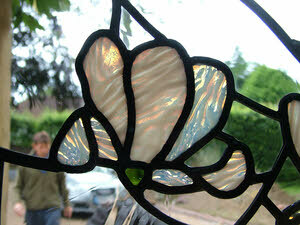 The herringbone glass is still a challenge to work with but at last I finished and they went into the door way. These are both encapsulated into 24mmm sealed units, Argon filled. A really lovely commission for a great customer, all in all a pleasure to work on but my hands needed a holiday!